If you are interested in applying for a Concealed Handgun Permit from the Boulder County Sheriff’s Office, please read the following instructions carefully. By appointment only. Please call 303-441-3600 to make an appointment. Appointments are available TUESDAYS and THURSDAYS from 8:30-3:30. Your fingerprints and photograph will be taken at that time. Payments for CCW applications may be made in person using cash, check or credit cards. If you wish to pay by credit card, the service is provided by a 3rd party vendor, Colorado.gov. There will be a $0.75 base charge, plus an additional 2.25% for all payments made by credit cards to help develop, enhance and maintain the service. You must bring all of these items to your appointment: Application—FILLED OUT**; Proof of training; Fees ($152.50 for a new permit); Colorado Driver’s License (you will need proof of Boulder County residency if the driver’s license has an out-of-county address on it). You must apply IN-PERSON to renew your Concealed Handgun Permit. 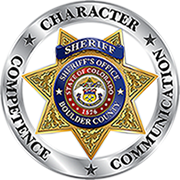 This can be done Monday-Friday, 8:00-5:00 at Boulder County Sheriff’s Office Headquarters. No appointment is required. Things to bring: application, Colorado Driver’s License, fees ($63.00 ($78.00 if renewal is late)), previous Concealed Handgun Permit (especially if it is from a different county). No training is needed. Per recently passed Colorado legislation, you can only renew your Concealed Handgun Permit with the Boulder County Sheriff’s Office if you are a resident of Boulder County (or own residential or business property). If you are not a resident of Boulder County, you must go to the Sheriff’s agency in the county where you reside (even if your permit was previously issued by the BCSO, you must go to the new county. Check that agency’s website for information on how to apply).